And we’re off! The starter’s gun has fired. 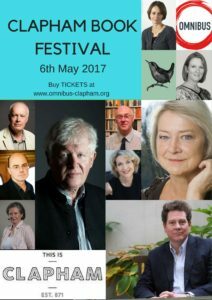 As of today, Friday 31st March, there are only thirty-six days to go until the second Clapham Book Festival. Tickets are now on sale for all sessions, a snip at £10 a session (£8 concessions). They can be purchased in advance through the Omnibus web-site or, if there are any remaining, on the door on the day of the event. Best to book up early as the theatre only seats a hundred, and we anticipate that demand for seats will be high. 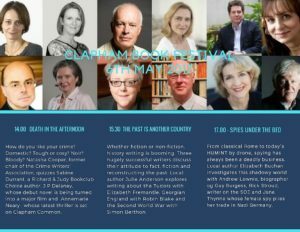 There are full details about the Programme on the Clapham Book Festival web-site, including snippets about the authors involved and their books. Come along for one or more of the afternoon sessions, for a discussion about crime writing from some of the most celebrated exponents (Death in the Afternoon). Find out how writers make history come alive – the subject of this year’s BBC Reith Lectures, to be delivered by Hilary Mantel this Spring – in (The Past is Another Country) or write about espionage and spies, real and imaginary (Spies Under the Bed). 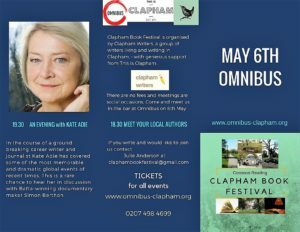 Have a drink with local authors at the early evening ‘meet and greet’ event in the Omnibus Bar or enjoy Kate Adie talking about her life and work in the evening. If….. you’d like to spend the day in Clapham – and there’s alot to do and see – your Festival ticket also gets you a deal in local cafes and restaurants. So, for example, present your Festival session ticket at Tart, our local tea-shop and patisserie ( The Pavement, Clapham Common ) and you will get a discount. All the books by writers at the Festival will be on sale in the Arts Centre, but you could also pop into Clapham Books to find others. If…. you live in south London and listen to the radio you’ll be hearing Kate Adie, Rick Stroud and Jane Thynne on Radio Wandsworth . Andrew Lownie and Sabine Durrant are being interviewed for SW Resident magazine, Kate Adie for Time & Leisure and J.J.Anderson for Aspire magazine. The Festival features in Essential Surrey, in various local newsletters, like The Clapham Society Newsletter and on social media sites like Gransnet, Mumsnet and others. Or you could follow us on Facebook, or Twitter, or Instagram – we’ll be sharing interesting facts about the authors and their books as the days pass and posting photographs. Posters will be appearing in SW London, as will leaflets and flyers, in local churches, doctors waiting rooms, leisure centres and Tourist Information Points ( I attach pdf copies to this article below, if you want to support the Festival please print them out and put them up in your workplace or on your local community notice board ). Clapham Book Festival is sponsored by This is Clapham.